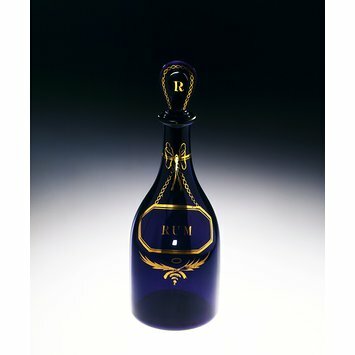 The original purpose of a decanter was to receive wine poured from a bottle or cask in order to leave the dregs behind. 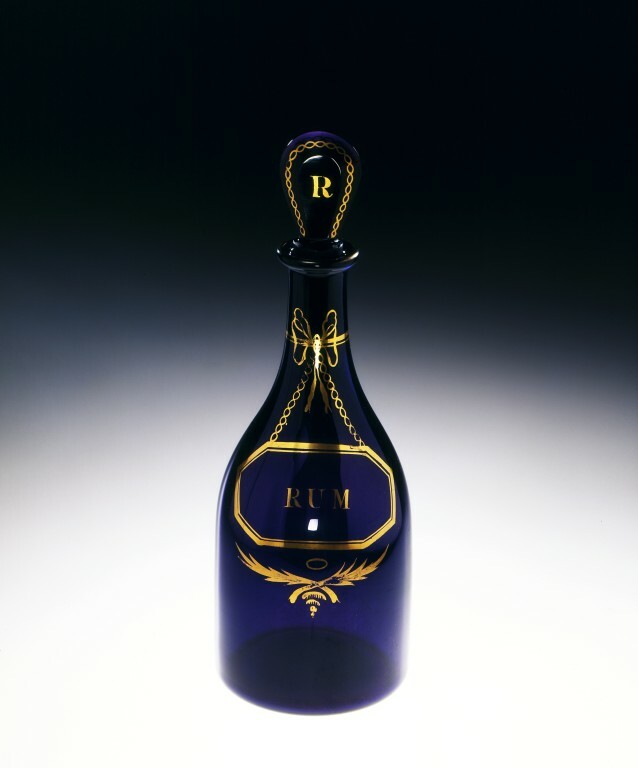 By the 18th century, however, drinks were matured in storage and decanting simply meant pouring drink from a crude storage vessel into a fine glass container more suitable for serving from at table. The mallet-shaped decanter developed into this more sloping 'shouldered' form during the second half of the 18th century. From the mid-18th century there was a vogue for coloured glass, chiefly blue and green, but later, and more rarely, purple, produced by the addition of manganese oxide. The gilt decoration purports to be a bottle ticket (probably of silver, enamelled copper or Sheffield plate), denoting the decanter's contents, its 'chain' apparently tied by a 'ribbon' around the decanter's neck. The decanter was made in Bristol in the West of England, which was second only to London as a glass-making centre in the 18th century. Bristol was one of England's richest trading ports, its prosperity based on the West Indian trade and the slave trade. It had local sources of furnace coal and glass-making ingredients (sand, lime, red lead). Purple Bristol glass is known to have been produced by three firms from about 1780: those of Lazarus and Isaac Jacobs; Wadham, Ricketts & Co.; and Vigor & Stevens (who later amalgamated with Wadham, Ricketts & Co.). Jacobs, for instance, advertised in 1806: 'burnished gold upon Royal purple coloured glass'. Michael Edkins (1734-1811), a freelance painter who is known to have worked for these glassmakers, may have decorated this decanter. Torrington, Arthur, Rita McLean, Victoria Osborne and Ian Grosvenor, eds., Equiano: Enslavement, Resistance and Abolition( Birmingham: Birmingham Museum & Art Gallery, c.2007), 93p:ill. ISBN 0-7093-0257-5.